Get Arcane Socks, Cloudburst Socks, Such Fun Socks, and Cheeky Cables Socks together as part of the 2018 Purl Kitty Sock Club. If you’ve purchased one and would like to buy the other three, they will automatically be discounted to the club price of $20. 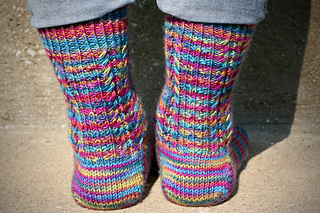 The Cheeky Cables Socks are an enjoyable mirrored cable pattern that compliments striped, semi-solid, speckled, and variegated yarns beautifully. The cables are bright and bold and stand out to add interest to your favorite sock yarn. The texture sections are a fun break from the cables and looks a lot more complicated than it actually is. It’ll be your secret with how easy it is to knit. This cable will become one of your new favorite techniques and is simple to achieve without a cable needle. These socks are written for the magic loop technique with a 32 inch circular needle, but can be converted to DPNs, or two circular needles. There are instructions that specifically address the right sock and left sock as this is a mirrored sock pattern.